Demi Moore at the Wallis Annenberg Center For The Performing Arts Gala in Beverly Hills, California. Demi Moore at the 20th Annual Night of Stars Awards. Demi Moore at the California premiere of "The Joneses." Michael Caine and Demi Moore in "Flawless." Demi Moore at the "Flawless" photocall. Demi Moore and Hilary Swank at the Miss Sixty Spring 2008 Fashion Show during the Mercedes-Benz Fashion Week Spring 2008. 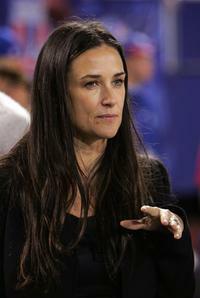 Demi Moore at the start of the game between Philadelphia Eagles and New York Giants. Demi Moore and Ashton Kutcher at the start of the game between Philadelphia Eagles and New York Giants. Demi Moore at the closing Ceremony of 55th San Sebastian International Film Festival, presents the movie "Flawless". Demi Moore at the 55th San Sebastian International Film Festival, attends a photocall for "Flawless". Demi Moore as Anne in "LOL." Demi Moore, Michael Radford and Lambert Wilson at the closing Ceremony of 55th San Sebastian International Film Festival, presents the movie "Flawless". Demi Moore at the Donna Karan Collection 2008 Fashion Show during the Mercedes-Benz Fashion Week Spring 2008. 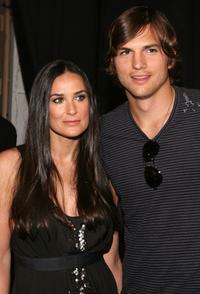 Demi Moore and Ashton Kutcher at the Mercedes-Benz Fashion Week Spring 2008. Demi Moore and Gabby Karan at the Donna Karan Collection 2008 Fashion Show during the Mercedes-Benz Fashion Week Spring 2008. Demi Moore and Mario Testino at the Mercedes-Benz Fashion Week Spring 2008, attend the V Magazine Celebrates Mario Testino party. Demi Moore at the Miss Sixty Spring 2008 Fashion Show during the Mercedes-Benz Fashion Week Spring 2008. Demi Moore at the Mercedes-Benz Fashion Week Spring 2008, attend the V Magazine Celebrates Mario Testino party. David Duchovny as Steve and Demi Moore as Kate in "The Joneses."